Okay Big, you're 28 Months today! I still feel a bit strange referring to you in months. It's not like I do that regularly, or in front of mixed company, but I guess in a monthly newsletter, it remains appropriate, somehow. This month, well, this past weekend has convinced me yet again of the significance of biology in that old nature-nurture saw. Friday was the first nice day here. What that means in Minnesota in the spring, is that it was the first day that wasn't below 38 degrees since October, but that's another story. Anyway, on such days in early spring, people pour out of their houses on to the sidewalks like honey from a full bottle. It is truly a remarkable thing unlike, I suspect areas like San Diego where people can take nice weather for granted. We were no different than the rest of our neighbors whom we hadn't seen for months, and you were trying out the array of vehicles we've collected for you over the past couple of years. 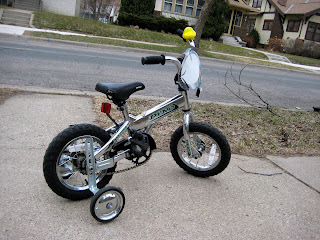 Eight had her bike out and was circling the block and you, unsatisfied with your three-wheeled scooter and no-pedaled bike, borrowed other kids' 'real' scooters and begged to sit on bikes much too large for your little body. You seemed to have already grown out of the tricycle that you had ridden to the coffee shop that morning with me and your friend Sophia. "Grown out of" implies that you had any ability to ride it in the first place. It is still a bit big for you and as of Friday morning, you were unable to comprehend the art of pedaling, so you would sit on the edge of the seat awkwardly while frantically walking on either side of the middle bar Fred Flinstone-style to put the trike in motion. This for the entire four blocks to the coffee shop, you back made me exhausted just watching (and practically running alongside of you). At one point on Friday night I went down to our musty garage and dug out Eight's (two-wheeled) scooter and your little bike with training wheels bequeathed to you from Three-of-Four last summer. This is literally the smallest bike I've ever seen. We never even purchased such a small bike for Eight as she had no interest until she was a bit older. Her entry-bike was a size up. You flipped for this bike. By bed time, BioMom had spent about 40 minutes talking with you about how pedaling works, and how to use your leg muscles to get the pedals around. We had a bit of time on Saturday morning, and the weather was still quite nice, so when I asked if you wanted to go ride your bike, it was all I could do to get your diaper on before you were out the door (you now know how to open the doors and even unlock them if necessary, which has truly changed the game around here for us as you ALWAYS want to be outside, but are still unawares of the rules of the road vis a vis cars.). After an hour or so you were starting to get pedaling down and could actually get the bike to move for two or three lengths of sidewalk blocks (about 12 feet). Sunday it poured. You kept asking to go outside to ride your bike, but I emphasized the rain and diverted your attention. After your nap, however, you wouldn't take 'No' for an answer and since Eight was interested in riding (I encourage her to do anything physical and would allow her to ride her bike in weather that would frighten a mail carrier if she showed a sliver of interest) we all headed out, rain gear and helmets in tow. By this time (literally 48 hours after your first tentative pushes on the pedal) you had it down. 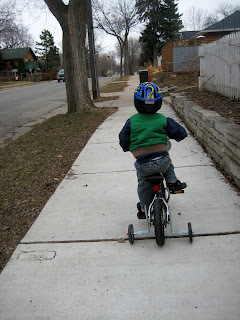 You pedaled that little bike around the entire block. . . TWICE! Beeping your little horn and pushing your way up the minuscule hills in the sidewalks. By Tuesday, you had me chasing after you (you still don't have the breaking part down, nor are you aware of where the sidewalk ends) and I am quite positive that you traveled the equivalent of an entire mile. I'm thinking of signing up for a marathon this fall as I'll be inadvertently training for one by chasing after you all summer. *Recently you've begun to refer to yourself as "Ponce" which none of us know from where this moniker came or what it means. *One recent phrase of yours: "That's the coolest truck I've ever seen!" *You are incredibly social (much more of an extrovert than I) and always want to know :"him name?" *You are still a devoted vegetarian. This actually happened to me tonight. . .